built out, easily making it the largest single wind farm project in the state. 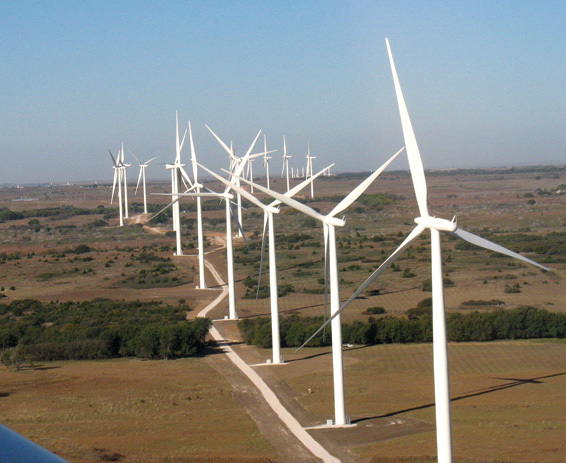 Oklahoma is well known for its significant wind resources, and the state is now tapping those resources and converting them into power for its 3.6 million residents. 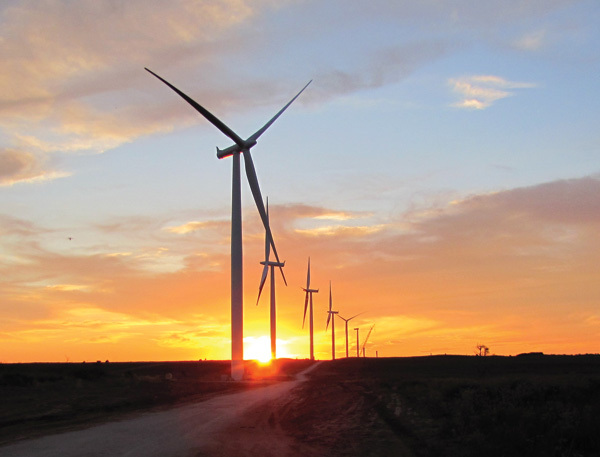 The most recent project involved the second phase of the Keenan Wind Farm, which—when fully built out—could be as large as 350 MW, easily making it the largest single wind farm project in Oklahoma. CPV Renewable Energy Company, an affiliate of Competitive Power Ventures Inc. based in Maryland, first started work on the overall Keenan site in late 2007, negotiating easements with landowners near the town of Woodward. The site is slightly to the east and south of the Oklahoma panhandle. "After a few months, we had a little over 30,000 acres under easement, and we started looking at the project as a multi-phase development where we would divide the site into a first, second, and final phase, totaling 350 MW," explained Sean Finnerty, president of CPV Renewable Energy. "We sited the project around a good wind resource based on our desktop investigation, followed by setting up met towers, and the expectation that new transmission lines and a new high voltage substation were going to be built in the area." to Oklahoma Gas and Electric Company (OG&E), which serves power customers in Oklahoma and western Arkansas. OG&E built that project, and it went into service in 2009. Next up: Phase two. The multi-phase approach essentially makes the Keenan project more do-able since, at 350 MW, it is quite large. "It’s hard to go out and find a single market for the power from a 350 MW wind farm," says Finnerty. "Certainly it’s been done, and is do-able, but it’s more difficult. We’ve found in our discussions with utilities that smaller phases, such as 100, 150, or 200 MW, are much more manageable slices of power for them. So we have designed all of CPV’s large- scale projects that can be divided into phases somewhere in that size range." Siemens 2.3 MW wind turbines. The project went into commercial operation this past December. In addition to CPV, the wind farm is co-owned by GE Energy Financial Services and Tyr Keenan II, LLC, an indirect subsidiary of Japan’s ITOCHU Corporation. Keenan II also marks CPV’s debut as an owner/operator of wind farm assets, something the company will be doing more of in the future. The northwest part of Oklahoma, where the Keenan project is located, has a very robust wind resource that is fairly consistent throughout the day. The land in this area is used primarily for cattle grazing and agricultural land and is slightly rolling. While CPV approached Keenan as a three-phase development, Finnerty noted that each phase is unique and requires very specific studies related to its layout and direct impact on the environment. "There are a number of early stage investigatory studies that we can do on the entire land holdings, and we generally start with a suite of high level environmental and engineering studies covering the entire site." Things like the meteorological program are site wide, and as the individual phases break out, that’s when the more layout-specific studies are implemented, he said. "The critical issues assessment that helps set up the project and phase-specific environmental studies are done site-wide—then we really bear down on the individual project phases." CPV carries out a number of environmental studies, from endangered and threatened species on a national and state level, to being aware of animals that may not be endangered, but are of particular local interest. Specific to the Keenan project, they looked at bats, whooping cranes, and prairie chickens. "We spend a lot of time doing environmental studies," says Finnerty. "We also do a lot of engineering studies early on to make sure we are not impacting groundwater or wetlands. We want to understand those impacts, if there are any, right upfront." This being Oklahoma, there is a fair bit of Indian history in the area, and this was included as part of the cultural and historical studies. "That is an area that we look at and take seriously, but we did not encounter anything." CPV has done wind power ventures in a number of U.S. states, and Finnerty said that Oklahoma has been particularly receptive to wind development. 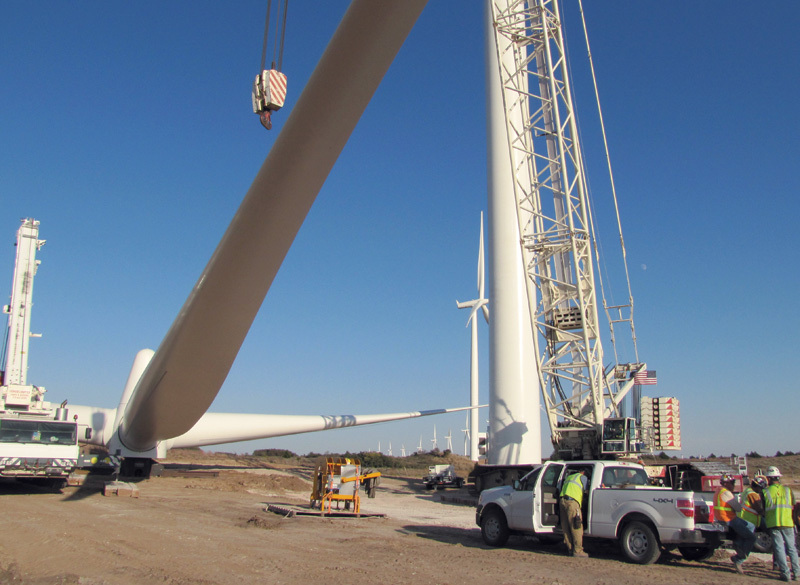 "Among utilities, OG&E has been very forward thinking in making sure the strong wind resource in Oklahoma has been utilized, and the Oklahoma Corporation Commission (the regulatory agency) and the environmental community have been very receptive to wind. "It’s been a great place to do business from a wind developer’s perspective." In terms of wind specifics, he says the northwest part of Oklahoma has a very robust wind resource that is fairly consistent throughout the day. "It’s a good place to locate a wind farm." All three phases of the Keenan project share these positive wind attributes. The site, south of the town of Woodward, is lightly populated. The land is used primarily for cattle grazing and agricultural land and is slightly rolling. "It’s not complex terrain," says Finnerty. "It’s very suitable for construction, and there is good geography for delivering and sorting equipment and getting construction done on a relatively easy and safe basis." The Delaney Group, owned by consulting and engineering services company Tetra Tech Inc., was the general contractor on Keenan II. They were also hired by OG&E as the general contractor for phase one of Keenan. "They were experienced in the area, and they knew going in what to expect," says Finnerty. As the Engineering, Procurement and Construction (EPC) contractor, The Delaney Group’s scope of work included full EPC of turbine access roads, turbine foundations of concrete and rebar, the electrical collection system, substation, transmission lines, and the operating and maintenance facility. They also provided support services for Siemens during their turbine erection process. Delaney used essentially the same team that constructed the Keenan phase one project. According to Delaney, Keenan II was the first time they managed document control through a Microsoft SharePoint site, which acted as a repository for all information related to the project. Everything, from document transfer and drawing archives to Plan of the Day sheets, meeting minutes, and overall project schedule, was uploaded and available to the customer, CPV Renewable Energy, and offsite management. During the past two years, Delaney has completed construction services on 19 wind construction projects valued at more than $340 million. These projects support nearly 1,700 MW of power, involved over 1,000 foundations, and over 600 turbines installed in New York, Alaska, Wyoming, Kansas, Oklahoma, Washington, Texas, Idaho, and Oregon. Delaney is part of the Tetra Tech family of companies, which has experience on more than 250 wind projects in 34 states and Canada, totaling more than 20,000 MW of wind power generation. Finnerty reports that there were the usual wind/weather challenges to deal with during the construction process. It really goes with the territory that a contractor is going to encounter high winds on a wind power project, but both The Delaney Group and Siemens did a great job of working around the weather, says Finnerty. "When you build these projects, safety is a primary concern," he says. "You want to make sure that you are always operating in a safe environment, and that is goal number one. The Delaney Group did a fantastic job in running a safe project for us during construction; I don’t think we had any lost time due to accidents. Kudos to them for doing a great job." While The Delaney Group knew what to expect construction-wise, CPV was quick and early to involve the town of Woodward and inform residents about what the project involved. "It has a very involved community, and a community that understands the balance between business and progress and preserving the environment—it’s a good community to do business in," he said. Finnerty explained that CPV engages, on several levels, the communities where it is building wind farms. "These are long lived wind power assets, so we need to be a good neighbor and be a partner in the community. We’re going to be there 20 or 30 years, so we want to be part of the fabric of that community. CPV Renewable Energy Company closed on project financing of Keenan II in February 2010, with construction following, using 66 Siemens 2.3 MW wind turbines. The project went into commercial operation this past December. "We also understand that we are guests when we first get there. With a wind farm project, our folks are sitting down with landowners, explaining the project and what our objectives are, and the pros and cons of the projects. We believe in sharing total information with landowners and the other stakeholders in the community. We don’t sugarcoat things. We want them to have the facts. "We’re very forthright with the landowners about the potential benefits they receive, the impacts during construction, and, in some cases, the impacts to their farming operations if they are doing row crops." The company starts this process early, to build support with landowners. They also reach out to local groups, be it the Rotary Club or 4-H, to explain what their wind projects are all about. Community buy-in is crucial to CPV, says Finnerty. "We’ve found that we have been very successful in building support for a project early on doing it this way. We’re interested in building a relationship with the community. We’re not interested in going into a community and forcing a power plant on them, whether it’s a wind or natural gas powered plant." CPV also builds natural gas power plants. As with its other construction projects, CPV and its contractor worked to source materials locally, if possible. In the case of Keenan II, there was a batch plant on site, so gravel and concrete were purchased locally. The northwestern part of Oklahoma has a lot of oil and gas development, so a lot of the construction systems infrastructure is already in place. "Obviously the needs are not identical between a wind construction project and the oil and gas business, but there is enough of an overlap that you have a labor pool and the suppliers who work with industry, such as crane suppliers and sand and gravel operations nearby. We were able to source a lot locally," says Finnerty. CPV dealt with a number of landowners to gather the acreage required for the overall project. There is a mix of medium to large landowners in this area of Oklahoma—some had holdings of several thousand acres, while others had 80 or 100 acres. There was no single, predominant landowner to deal with in the overall Keenan project. CPV entered into an agreement with the county that involved the company upgrading some of the roads they were using and also making what Finnerty termed a "sizeable" contribution to help with the upkeep of the local road system. The Southwest Power Pool approved the construction of new transmission lines and a large substation; the latter was almost adjacent to the Keenan II project. So where to from here for CPV, now that Keenan II is complete? Although there is no firm timeline, Keenan III is on the horizon. The 10-year-old company, which was founded by OG&E veterans Doug Egan and Gary Lambert, also has a number of other wind and thermal power projects on the go. They have also been busy being asset managers. "We’re still very involved in project development, but we’ve also moved into providing asset management services to lenders," says Finnerty. Following the collapse of Enron and the merchant power market, a number of equity sponsors of power projects were either foreclosed on or basically handed the keys to power plants back to the debt providers—and walked away from power generating assets. "We stepped up and suggested to some of the lenders that we would be able to go in and manage those projects on their behalf, and that has become a very good business for us," says Finnerty. "We now manage almost 5,000 MW of generation across the U.S. on behalf of non-traditional, non-utility owners, such as hedge funds." As Finnerty puts it, CPV is not out there "turning the nuts and bolts" at these power plants, but they manage contractors, fuel purchases, load documents, and oversee the capital expenditures and Operations and Maintenance. "It actually gives us good insight into various power markets. It also helps us to understand what the various decisions we make on the development side translate into on an operating project—it helps make us better developers."